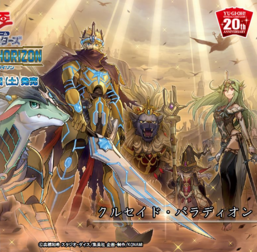 In the artwork of "Crusadia Vanguard", from left to right: "Crusadia Draco", "Maximus", "Leonis", "Reclusia", and "Arboria"
"Crusadia" (パラディオン Paradion, "Palladion" in Japan), is an archetype that debuted in Cybernetic Horizon. A Force United Against the Threat Looming Over the World!! Avram and Imduk's journey of battle continued on, for many years. During their travels, they discovered other tribes who had been divided by the Mekk-Knights long ago. Together with these new allies, they formed the group "Crusadia" to fight back against the threat looming over the world. Avram, who has combined the power of the World Chalice residing within him as well as that of the World Crown, once sealed away by the tribe of the Sacred Tree, now marches on toward the stage of the final battle. Avram and Imduk, Fully Grown, Form "Crusadia"! As their enemies were too mighty to face alone, the two begin their search for many comrades to aid in preventing the threat against the world. By the Power of the World Legacy, They Evolve! All members of the "Crusadia" archetype wear a fragment of "World Legacy - "World Crown"" on their head, in order to signify their connection to the relic that they draw power from. The archetype's name in the OCG ("Palladion") is based on Palladium (also known as Palladion), from ancient Greek/Roman mythology, a cult image of great antiquity that Rome was said to depend on. In the English language, since around 1600, it has been used figuratively to mean anything believed to provide protection or safety. "Palladion" may also refer to the word "paladin". The archetype's name in the TCG ("Crusadia") is likely based on "crusade", a war instigated by religious sanctioned campaigns. Both paladin and crusader are character classes that often appear in RPG's. Both have similar concepts as a holy warrior of light, usually donning hallowed heavy armor, wielding a shield and a sword, possessing holy abilities, and being engaged in a holy war. All Main Deck members of the archetype can be Special Summoned to a zone that a Link Monster points to, in Defense Position, whilst the archetype's Link Monsters all gain ATK equal to the original ATK of all monsters they point to, but prevent those monsters from attacking. World Legacy - "World Crown"
World Legacy - "World Lance"
This page was last edited on 12 February 2019, at 02:21.